5.0 out of 5 starsEasy listening - and who cares?! Ordered for a friend, whom was very pleased to get this rare recording. 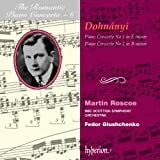 heard it on classic fm and fell in love with it, ordered it and it now plays in the car on the long journeys across the country..
4.0 out of 5 starsVirtuoso Late Classical Concertos. 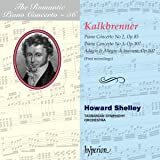 Friedrich Kalkbrenner (1785-1849) was another of those early 19th century pianists who composed concertos as vehicles for their own virtuosity. According to the notes which come with this disc he was born in a post-chaise somewhere between Berlin and Kassel and grew up at the court of Prince Heinrich in Rheinsberg where his father was choirmaster. Later he studied in Paris and also in Vienna where he played duets with Hummel and met Beethoven and Clementi. He also came to England, living in Bath and London where, apparently, he used to charge a guinea for 40 minute piano lessons, the highest rate in the city. He made more money by buying into the "Chiroplast", a mechanical device which was fitted to the piano and restricted vertical movement of the arms and wrists. He eventually returned to France dying near Paris in 1849, a victim of that year's cholera epidemic. As a man, Kalkbrenner was famous for his vanity and the entertaining notes recount a number of amusing incidents which illustrate this. He told Chopin that "after my death or when I stop playing there will be no representative of the great pianoforte school". Clara Schumann thought that he always looked as though he were saying, "Oh, God, I and all mankind must thank Thee that Thou hast created a mind like mine!" Yet there is no doubt that, as a pianist, Kalkbrenner had a fabulous technique. The piano writing in the concertos on this disc bear this out. He was not, however, a composer of the first rank and you should not investigate these concertos before you know those of his great contemporaries. 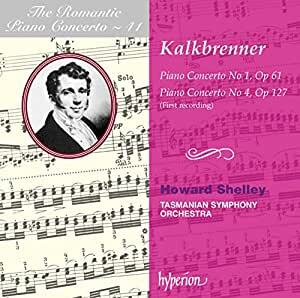 Kalkbrenner's music is fairly anonymous in style and, if you know the concertos by Herz, Moscheles or Hummel which Shelley has recorded for Hyperion and Chandos you'll know what to expect. Frankly, it would be difficult to draw any real stylistic distinctions between these composers' concertos. 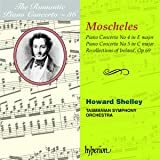 The First Concerto dates from as early as 1823. It is dangerous, then, to suggest that it shows the influence of, say, Mendelssohn, Chopin or Schumann all of whom were only in their early teens at the time. 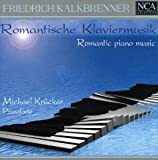 Indeed, Kalkbrenner himself described himself as a Classical and not a Romantic composer. (You could, perhaps, sue Hyperion for misrepresentation on these grounds!) Those far greater composers took from the music of Kalkbrenner and others what they needed in order to synthesise their own individual styles, eventually writing music of an expressive range which was, certainly at this stage in Kalkbrenner's career, entirely foreign to him. Kalkbrenner's First Concerto opens with a sonata form first movement. The themes are rather short-winded and not truly memorable but are suited to the composer's needs. Kalkbrenner sometimes gives his tunes a rhythmical quirk to make it easier for them to stick in the memory. The second subject, for example, uses the distinctive so-called "Mozart rhythm" (crotchet, dotted quaver, semiquaver, crotchet, crotchet.) This movement is moderately entertaining but, at 14 1/2 minutes and with so much meretricious piano writing, it's a long haul. The slow movement is a ternary structure and the finale is, as you would expect, a rondo. Both are reasonably strong melodically and do not outstay their welcome. There is a dazzling burst of virtuosity from Shelley at the end. 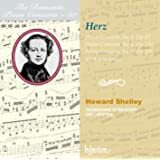 The Fourth Concerto (1835) is unusual in that there is no proper orchestral exposition. The first theme is again more notable for its rhythmical than its melodic interest. The soloist enters with a new theme and eventually arrives at the second subject. It's rather a good one, building to a chordal climax. Much of the development section is built on the rhythm of the first theme. There is a regular recapitulation. The slow movement has, as the notes say, "the undercurrent of a funeral march". It is still, however, essentially decorative and lightweight. The finale is another rondo. Its main theme is not particularly distinguished but there is a striking fugato passage (beginning at 5 mins 10secs) which soon takes the music into an entirely unexpected world of dramatic expressiveness. It doesn't last long, however, and the concerto ends with the expected burst of virtuosity from the soloist. Curiously, this passage is separately indexed on the disc. 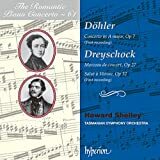 Both these concertos are worth getting to know, then, as long as you accept them for what they are...virtuoso late Classical concertos which, although they employ Romantic techniques (you will soon spot that Chopin was greatly influenced by Kalkbrenner), only display a very occasional flash of Romantic passion. 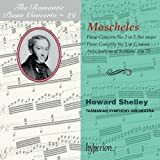 Shelley and his Tasmanian forces are, as always, beyond criticism and the recording is excellent. 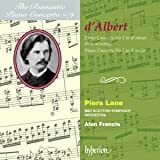 I like exploring the unknown romantic piano concertos and I have many on disc. This is quite honestly one of the most boring. 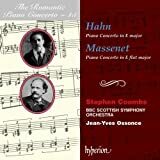 True,the piano writing is absolutely scintillating but musically these concertos have nothing to offer.The mind soon wanders, perhaps because it is all on the same level of unbelievable,empty, virtuosity. 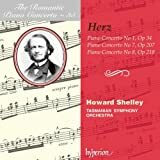 Howard Shelley's playing is wonderful, with excellent orchestral support and very good sound.It is a pity that this disc cannot be recommended.